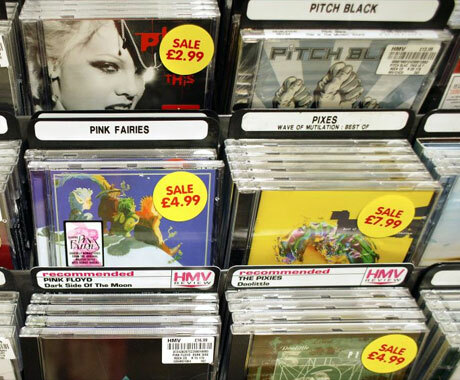 The slow death of physical media may be even slower than expected, if UMG’s new pricing structure takes off: CDs will actually be priced lower than their digital versions. Universal Music Group, one of the “Big Four” major labels, is the first to react to the years-long decline in CD sales. CD sales are down 15.4% this year, a slightly slower decline than the two years prior but still a huge drop, and though digital sales are nearing the volume of physical sales, revenues are still plummeting. Retailers and consumers alike have clamored for lower prices on CDs, and the labels have responded far too slowly, dropping from $18 to $13 in 2003. Now, UMG is radically changing the price of the dying format, to between $6 and $10 for single-disc releases. The announcement is making the other labels quite nervous–they’ll probably have to follow UMG’s lead, whether the program is successful or not, and really, it doesn’t matter if it’s successful or not, given CDs have precious few years left anyway. But sources from the other labels say that they may simply drop the standard price to $10, which while not as drastic as UMG’s strategy may still encourage more CD purchases. After all, CDs are objectively superior to music purchased from digital retailers like iTunes, Zune, and Amazon. They come with album art and a booklet, they never have DRM, and they’re encoded in high-quality lossless WAV files that can then be ripped in any format of any quality the user wants, including several other lossless formats. But on the other hand, buying a CD is certainly a bigger pain than downloading; a user has to get to a store, get home, rip the album, and then move it to a portable device, rather than simply clicking a few times in iTunes. And, of course, environmentally speaking, CDs are far more harmful. Still, if the choice is between a $6 CD or a $9.99 iTunes album, the CD is unquestionably the superior choice. While this is an encouraging show of flexibility from the notoriously rigid major labels, it’s not going to change the basic fact that the move is merely delaying the death of a format. The cut isn’t going to “revitalize,” “save,” or “make viable” CDs: it’ll just make them slightly more desirable for a couple of years until digital firmly buries physical.